Oh no! Capozzoli's is CLOSED! How sad! Ryan and I loved going here. It was a little family owned Italian restaurant. The owner (old grandpa man) would come around and give everyone hugs. Ryan looked it up yesterday, thinking that maybe we would eat there last night, and saw the bad news! I guess it being closed twice while the McClurgs and Leighs were here for Thanksgiving makes more sense. Thankfully madre and Stacey (and Gabe) got to enjoy it while they were here in October. WHAT A BUMMER! 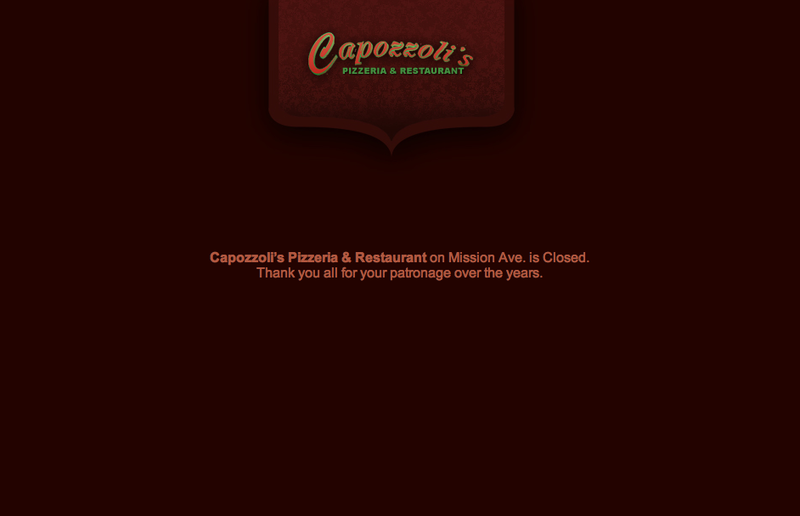 Capozzoli’s Pizzeria & Restaurant on Mission Ave. is Closed. Thank you all for your patronage over the years.